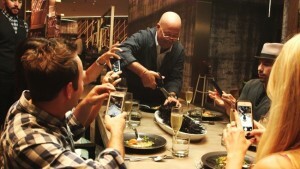 Whetting the appetites of next generation business travelers with unexpected cultural experiences, Renaissance Hotels today announces “The Navigator’s Table,” an original video series featuring James Beard Award Winning TV personality Andrew Zimmern. Premiering online on May 3, 2016, the unscripted dinner series features Zimmern hosting unusual tastings in Chicago, Nashville and New York with influential chefs and food insiders at Renaissance Hotels. The six-episode serving illustrates the brand’s commitment to providing business unusual experiences that appeal to its culturally curious guests, inspiring them to seek intriguing evenings at Renaissance Hotels around the world. Chicago, May 3 & 5: Zig-zag from Northside to Southside as Andrew samples sea urchin and grilled octopus before diving into deep dish pizza with guests Billy Dec (Restaurateur), Christina Grdovic (SVP and Publisher Food & Wine), Kara Lichtenstein (Hungry Social), Lee Wolen (Boka) and Louisa Chu (Chewing the Fat). Click here to watch the premiere episode! Nashville, May 10 & 12: Andrew gets in harmony with local favorites indulging in goat tartare, squirrel and seafood gumbo and hot chicken with guests Kahlil Arnold (Arnold’s Country Kitchen), Sarah Gavigan (Okatu South, Pop, Little Octopus),Carla Hall (co-host of ABC‘s “The Chew” and Chef-Owner of Carla Hall’s Southern Kitchen), Rachele Lynae (Musician) andPat Martin (BBQ Chef). Click here for a preview of Nashville’s episode! New York, May 17 & 19: New York may be the Big Apple, but Andrew is substituting fruit for local duck tarte flambé, freshly harvested seaweed and venison with braised cabbage and sweet potatoes. Culinary luminaries joining Chef Zimmern at various New York dining hot spots in addition to the Renaissance New York Times Square include Dana Cowin (chief creative officer of Chefs Club International), and chefs Daniel Boulud (Chef-Owner of several award-winning restaurants and Feast & Fêtes catering), John Besh (author, chef and restaurateur) and Jose Garces (restaurateur, Iron Chef Winner). In addition to serving as guest Navigator on the series, Zimmern is adding to the brand’s ‘Evenings at Renaissance’ programming worldwide by creating bar snacks inspired by his travels and experiences to the regions where Renaissance Hotels are opening new properties this year. Each dish reflects a different regional cuisine interpreted with signature Zimmern flair. The bar snacks will be available exclusively on June 16, 2016, Renaissance Hotel’s annual ‘Global Day of Discovery’. Poutine: A Canadian staple, French fried potatoes served with cheese curds and roasted duck gravy. Inspired by Renaissance Montreal, which opened January 2016. Andrew Zimmern’s All-Beef Piedmontese Canteen Dog:The classic New York hot dog reinvented for the modern world. Served with fresh minted kraut, roasted vegetable mayo, house mustard, pickled chiles and herb shake. Inspired by Renaissance New York Midtown, which openedMarch 2016. Duo of Gougère and Pisalladière: A take on a traditional Parisian dish, classic choux paste crisps with gruyère and jambon cuit served alongside the famed caramelized onion tart of Provence. Inspired by Renaissance Paris Republique, which opened April 2016. Sate Lilit: Inspired by the cuisine of Bali, a satay made from minced pork and shrimp and mixed with grated coconut, thick coconut milk, lemon juice, shallot, turmeric and pepper. Inspired by Renaissance Bali, opening June 2016. Middle Eastern Meze: Influenced by the flavors of Dubai, a meze of spiced eggplant dip, lemon-rice stuffed grape leaves and lamb kibbeh served over hot pita. Inspired by Renaissance Downtown Hotel, Dubai opening December 2016. Guests can book a stay and check out the full lineup of events and performances planned throughout the year at Renaissance Hotels by visiting www.renhotels.com/events or www.facebook.com/renhotels.